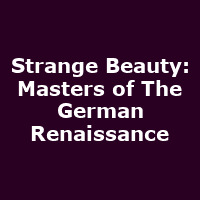 "This exhibition takes a fresh look at German Renaissance paintings in the National Gallery Collection, providing insights into the way these works were perceived in their time and in the recent past, and how they are seen today. It will focus on some of the best-known artists of the period, including Hans Holbein the Younger, Albrecht Dürer and Lucas Cranach the Elder. All famous artists in their own time, the exhibition will highlight the ways in which their paintings, drawings and prints were valued in the 16th century for qualities such as expression and inventiveness."